The Collaborative Program in Ancient and Medieval Philosophy (CPAMP) is pleased to welcome Terence Irwin, emeritus professor of ancient philosophy at Keble College, University of Oxford. 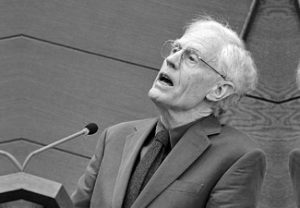 In addition to ancient philosophy, Professor Irwin’s research also focuses on ethics, practical ethics, and Kant. Professor Irwin has published almost 100 essays and articles in journals and volumes of conference proceedings, and authored a three-volume collection titled The Development of Ethics (Oxford University Press). Professor Irwin’s talk will be followed by a reception. The Collaborative Program in Ancient and Medieval Philosophy (CPAMP) is an interdepartmental program of doctoral study at the University of Toronto, jointly administered by the Department of Philosophy, the Centre for Medieval Studies, and the Department of Classics.